In small groups of no more than 6, you’ll glide effortlessly around paradise on an all-terrain electric hoverboard! The 2-hour 45-minute fun and highly informative tour showcases the beauty, history, and unique culture of Hawaii. While exploring the best of Waikiki, you'll learn all about Hawaii while being wireless connected to your expert guide for commentary and music along the entire ride. Hover up to the cliffs of Diamond Head with panoramic ocean views, glide past charming cottages and multi-million dollar estates of the Gold Coast, stop at secret beaches, sample local snacks, marvel at the palm tree laced Ala Wai Canal while riding past outrigger canoe teams, roll through century old banyan trees, uniquely capture epic photos of yourself with the most beautiful backdrops, discover little known secrets of Waikiki while taking in many more highlights! Packing in so much, it's the perfect 'intro to Hawaii' for new visitors! Your 2 hour 45 minute hoverboarding adventure starts when you make your way to the front of the Honolulu Zoo in Waikiki and meet your local guide. After a safety instruction and practice, your hoverboard will become an extension of you to effortlessly explore the island on. Pop on your wireless one-ear audio receiver to learn about Hawaii's nature, history, and listen to nostalgic Hawaiian music as you hover from place to place. Since you'll start in the heart of the action at Kapiolani Park, you'll first learn to recognize some of the most popular island trees such as exceptional Indian Banyan, Rainbow Shower, Monkeypod, Ironwood, Plumeria, Coconut Palm, and more. We take in the impressive beach views while learning about ancient Hawaiian and modern surfing on Oahu, known as the 'birthplace of surfing'. Stop at a little known prior human sacrificial temple location and learn about Hawaii's ancient Gods, Kings, Queens, and priestly Kahuna. Listen to beautiful examples of uniquely Hawaiian instruments such as the slack key guitar and ukulele as we explore the bandstand, then take a profile pic worthy photo at Diamond Heads most photogenic location. Hear about the island's volcanic birth, and learn how the fire Goddess Pele created it all! As you look into the water for fish at a popular snorkeling and scuba location, your guide will show closeup photos of native marine life like green sea turtles, Hawaiian monk seals, sharks and more! 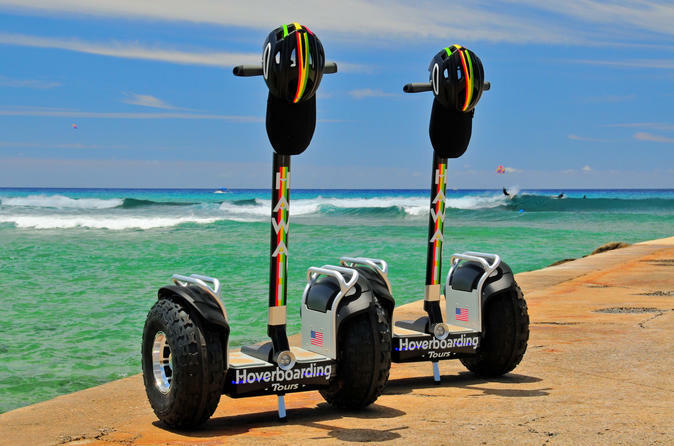 Hover to the Waikiki War Memorial and Natatorium, then glide over the sand along a palm tree lined walkway to a local favorite beach San Souci. Take in the charming historic cottages and multi-million dollar mansions in the Gold Coast while learning about the architecture and real estate development of Hawaii. You'll next climb up the face of Diamond Head to marvel at the panoramic ocean vistas, look for neighbor islands and whales in winter months, and point out hidden bunkers and diamond head's military history. Heading back we stop to sample some local snacks, see where one of the richest men in Hawaii in the 50's and 60's once lived, listen to nostalgic tiki pop culture comedy songs, ride through an Indian banyan that is over a century old, and learn about Hawaii's first and last king's. Try to guess Hawaii filmed movies and TV shows from their soundtracks on the way to take in the palm tree laced Ala Wai Canal. This often missed two mile canal on the edge of Waikiki, provides beautiful views of the Koolau Mountains and practicing outrigger canoe teams. It's also very important because it made possible the development of Waikiki, which prior to it's creation in 1928 was a swampland. You'll then glide past off the beaten path residential condos, prior residences of past monarch's, along Waikiki beach past the famous "Duke" statue, and to the oldest surviving hotel in Waikiki- the 1901 Moana Surfrider. You'll return to the start location with famous Hawaiian music.